This rug is absolutely gorgeous and fits our room so well. Very high quality an wonderful to walk on. It is really stunning and opens up the room so it seems bigger. 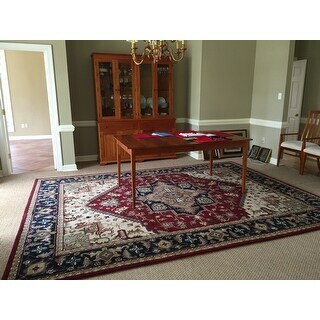 Safavieh Handmade Heritage Traditional Heriz Red/ Navy Wool Rug - 9'6" x 13'6"
More beautiful than in the pictures! I can't believe how stunning the carpet really is. We put it down immediately not knowing what to expect and I can say I was blown away. The beautiful colors, fabulous design and it is so plush. WOW. I can't believe this was a quarter of what we'd pay in a furniture store (or more). We are delighted with this carpet. Beautiful rug. I purchased it for my dining room and it has brought a more elegant look to the room. The rug looks wonderful on my wood floor. The colors are gorgeous. Before I received the rug, I thought the red/burgandy color would overpower the beige upholsery in my chairs but the beige and gold elements in the rug actually makes my heirloom furniture look even more beautiful. I love the rug so much that I have subsequently purchased the matching runner to use in the adjacent hallway. It's a great product. Perfect, beautiful, and a pleasure to walk on! 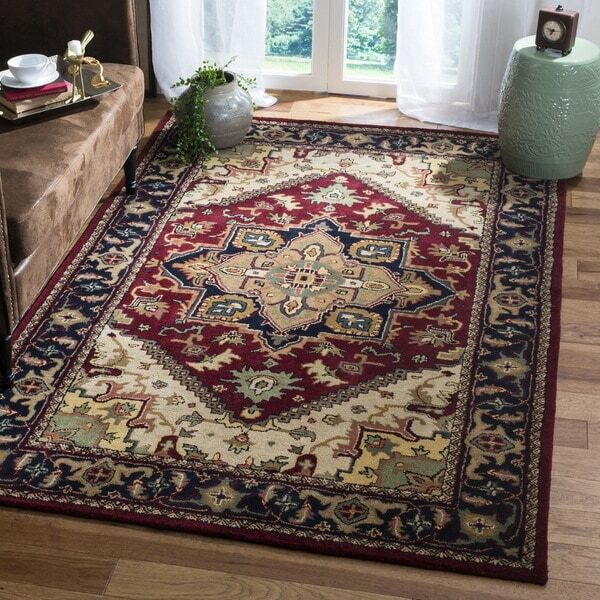 I ordered this rug to coordinate with an older synthetic rug that is in the adjacent dining area. This rug has the same dark red and dark border. My old rug has a lot of black in the border. This rug says navy, but it is such a dark navy that it coordinates well. It looks lovely against our natural oak hardwood floors. I love going barefoot, and walking on this rug is a treat! I anticipate many years of enjoyment from this rug and marvel at its low price. I have never written a review before but was so happy with this rug purchase I wanted to! I bought the 9 x 12 size. I don't do a lot of online shopping especially for large size items as returning is always a problem and its a lot of money to spend on something you can't see and touch prior to purchasing. There are not many rug shopping options where I live and I just realllly liked the picture and the price! I was concerned about the color and wasn't sure because several reviews said the color was accurate and several said it was not. Since I was not trying to match anything I took a chance and ordered the small rug for the foyer and the large one for the living room. I am very happy with the rugs. They are very thick and of good quality. The small rug is actually too thick to use by the door because the door won't open.I love the colors which are very rich. The colors are as pictured. The large rug appears lighter than the small rug because beige areas are larger due to the size of the rug. It does shed but it is not a big problem. I love this rug! This Hand Tufted Wool Rug is absolutely beautiful! The price was GREAT as well! It was packaged appropriately...folded instead of rolled. Which is the way a oriental should be shipped, wrapped in thick paper. I was very impressed by the packaging. Unfolded beautifully and laid right down. As with all wool orientals some shedding is to be expected and believe me this one sheds, but I am a daily vacuum girl so no worried for me! The design was exactly as described. The colors however were not like the photo....the burgundy is the more dominant color vs the navy blue which is predominately around the border. But I read the descriptions from other purchasers and I knew what I was getting. Check the Safavieh website and other and Overstock had the best price!!! It is a lovely addition to my home and compliments my other orientals. 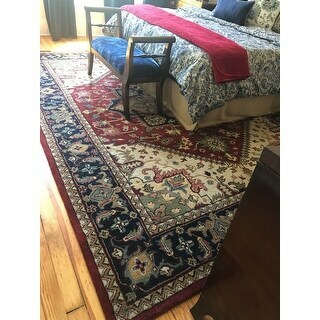 I have 6 other oriental wool rugs and have had some of them for 20 years or more, this Safavieh rug is thick, the colors are vibrant and the pattern is well designed. It is one of the best in the collection and was the best price by far, hope for many years of enjoyment. We were really pleased with this rug. It is so well made for the money. The colors are vibrant and and true to the picture. The red is a darker red, but still red (not wine or burgundy). The blue is navy. We purchased this rug to replace an old rug that had just gotten too hard to keep clean. The old rug was pretty cheap and we had to tape the corners down to keep it from curling up. The Safavieh rug was expensive, however with it on sale, we thought we should try it out. WOW what a difference! The colors are vibrant and appear just as they did in the picture. The added thickness and weight of the rug made it comfortable to walk and lay on. AND no taping down of corners! the rug is so beautifully designed that it really is a piece of art. 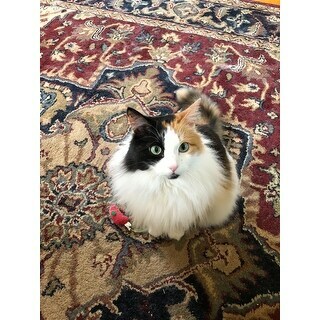 Beautiful rug. Adds richness and elegance to a room. I have gotten many compliments on this rug. Classic rug. Looks elegant. Thick and luxurious. Colors are true to website.I have this in the library (our den) and love it. It’s unchanged after several years of being walked on many times daily.i’m thrilled with it. 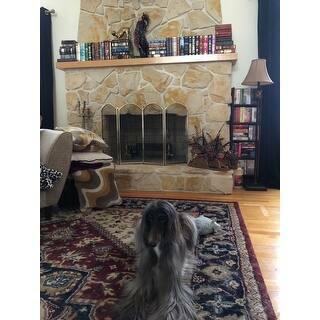 I had a library imagined with a rug like this. Just love it! This rug is beautiful but it shed terribly. I have to vacuum everyday. When i do i must empty the vac. 2 to 3 times. I think before it is all over with i wil not have much rug left Very disappointing. I absolutely love the design and quality of this rug. It is very think and feels luxurious. Love the blue around the edge of it as well. The only thing is that the center is a darker shade of beige than what I expected. I thought it would be lighter but I loved, love, LOVE this rug! Was a little nervous to buy such a large pattern wool rug online, but can't be happier with this purchase. The colors match exactly to what was represented on screen and the pattern is lovely. It's a wool rug, therefore, does shed for a period, but I expected this and would rather vacuum a little more than usual to own such a beautiful rug at an affordable price point. This rug is beautiful, super thick and worth every penny. I was skeptical because of the price, but it is definitely high quality!! So beautiful in our family room! Very heavy, so if you do not like a thicker carpet you will not like this. It is really nice. These are wonderful plush rugs. Vibrant colors, liven up my dining area. Safavieh is a great brand, 100 year old. I have purchased about 4 rugs. I like them. And I am about to buy more! It is a great quality for the price. I have been thoroughly satisfied. Yes, these rugs shed a bit for the first 3 months for me. I recommend running your Roomba over it or your regular vaccum and then they stop shedding! Value buy for a premium carpet, HAND MADE. Life long value. Love the colors in this rug. It brings a beautiful accent to the room. Wow! 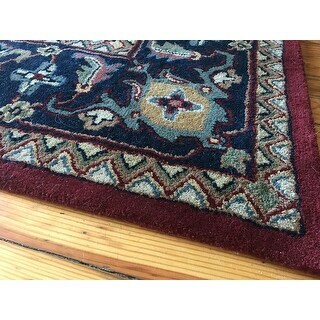 Beautiful rug at a great price. Love it in my living room. Wasn't sure at first about ordering a large rug like this online but it was great. Delivered in a timely manner and we just had to get it inside. Would definately order a Safavieh rug again. Colors are amazing and the feel is great. One draw back, it sheds something awful. I fill up a canister on my vacuum each time I clean just on this rug. I keep thinking this will slow down over time but after two months no such luck. I have owned wool rugs in the past but not one that sheds everywhere. 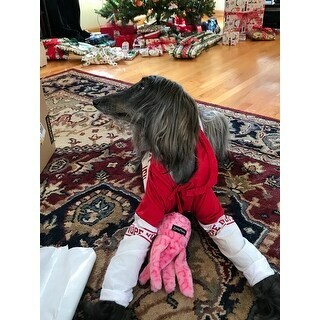 My socks are all covered now. So, great looking but yuck to shedding. Very high quality, beautiful colors and laid out beautifully when unrolled. The rug is padded well and vacuums nicely. Love the way it looks in our living room! "Also are there runners and a smaller rug that is just like this one? I"
Yes. The runners are just like the rug. I purchased the rug first and loved it so much that I purchased the 2'3' X 8' runner to go with it. The runner is just like the rug. In fact, I have the runner in the same area as the rug and they are beautiful together. The colors, designs, etc. are alike. If you can use a runner in the same area as you are using the rug, there are several size runners that accompany this rug (i.e. 2'3" X 8; 2'3' X 10). "I am trying to figure out the center color. Most pictures the “red” looks maroon but the last picture actually looks red. Which is it"
The middle is a dark red color. Please note that some colors may vary due to dye lot variation from production. Same color as the border. Mine is a deep warm red. I don't see burgundy at all. Deep warm red...no pink undertones in the red at all. "Do you have an 8 x 11 or 8 x10 available in this rug? 9 x 12 is just a bit big....thanks"
Hello veggiegirl, we appreciate your inquiry. This rug does come in a 7'6 x 9'6 option under item #10384394 . However, it is unavailable at this time. There is a chance that we will re-stock it sometime at the end of February, please check back with us periodically. We hope this information has been helpful. Thank you for shopping with us. Have a great day!